Our contributor, Erica OBrien, owner of Erica OBrien Cake Design, is back for her second post in our new series called Trending. Erica is helping us translate today’s top trends in fashion, design, art and everyday life into fabulous cake designs. 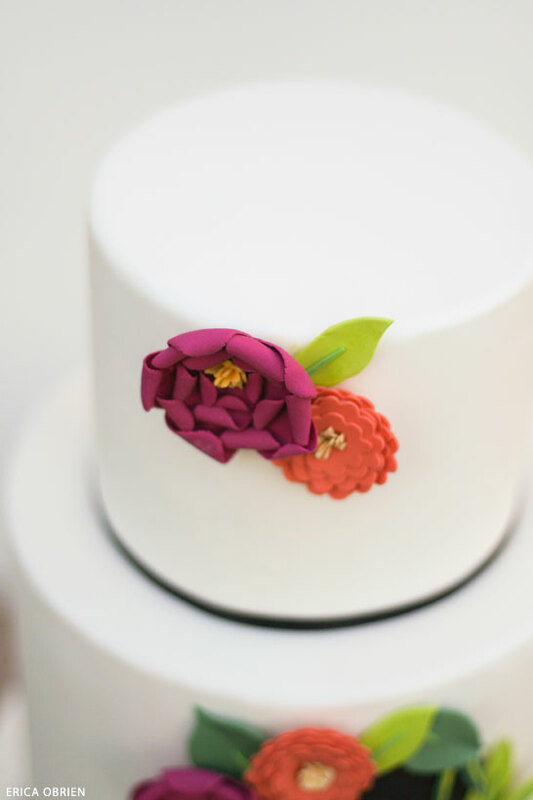 Watch each month as she goes from inspiration on pinterest to cake concept, sketch and then the final cake design. With this insider look into her creative process, we hope you’ll start to see inspiration everywhere in world around you. 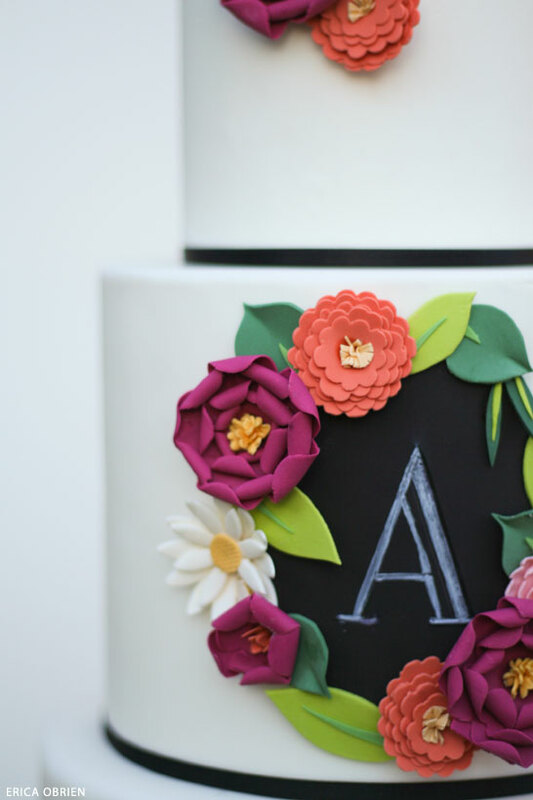 Today we’re tackling two trends in one, chalkboard art and paper flowers. Erica will take it from here…. When it comes to using non-edible elements on a cake, I’m somewhere in the middle of the spectrum between those who insist that everything be edible and those who believe a few wooden 2x4s and some rice crispy treats qualify as a cake. I’ve always liked the look of real ribbon to finish off the base of a fondant cake, and won’t hesitate to use a non-edible button or brooch if I feel it adds to the design. Lately, I’ve been in love with the paper flowers that seem to be everywhere, and I’ve even designed a few cakes featuring tissue paper flowers. 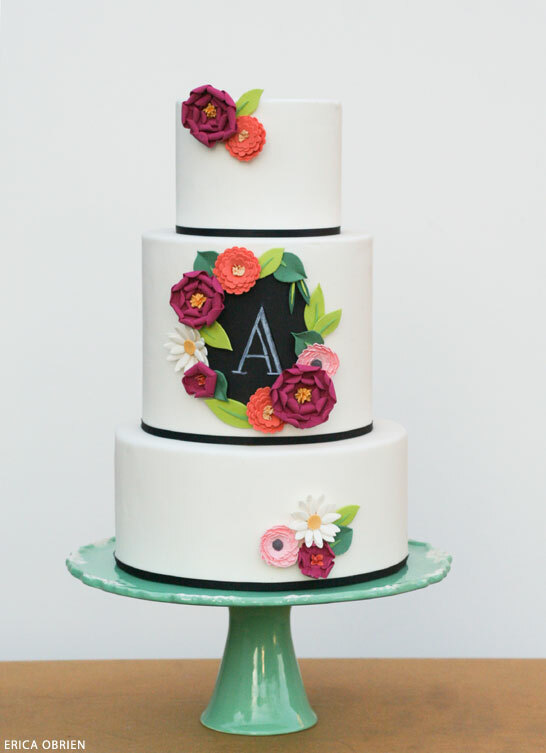 But for this cake, I wanted to create an all-edible version of paper flowers–something fun and whimsical yet trendy and current. Something crafted by hand, out of fondant. To create the flowers, we made simple cuts using various flower cutters, layered them, and shaped to dry. 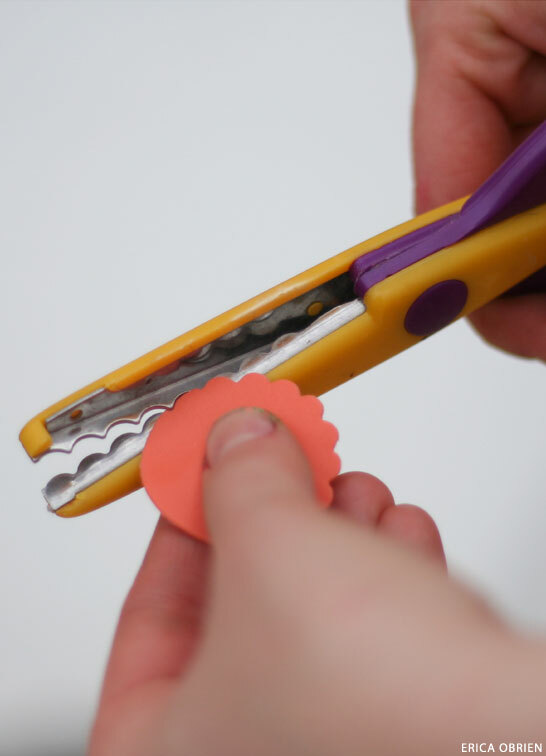 To achieve the small scallop on the coral zinnia-inspired flower, we cut rounds out of 50/50 (50% gumpaste mixed with 50% fondant) and used a scalloped scrapbook scissors around the edge. The leaves were cut by hand and layered using different greens for depth. 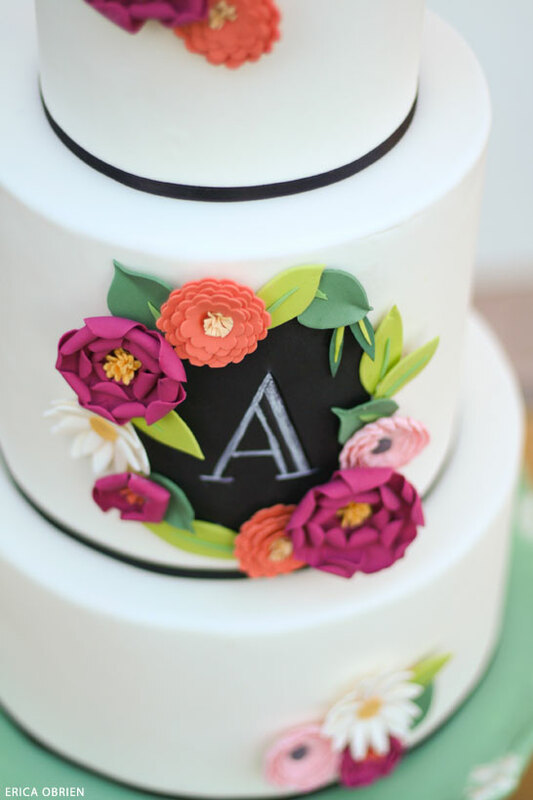 We chose a chalkboard monogram to compliment the darker tones in the flowers and leaves. 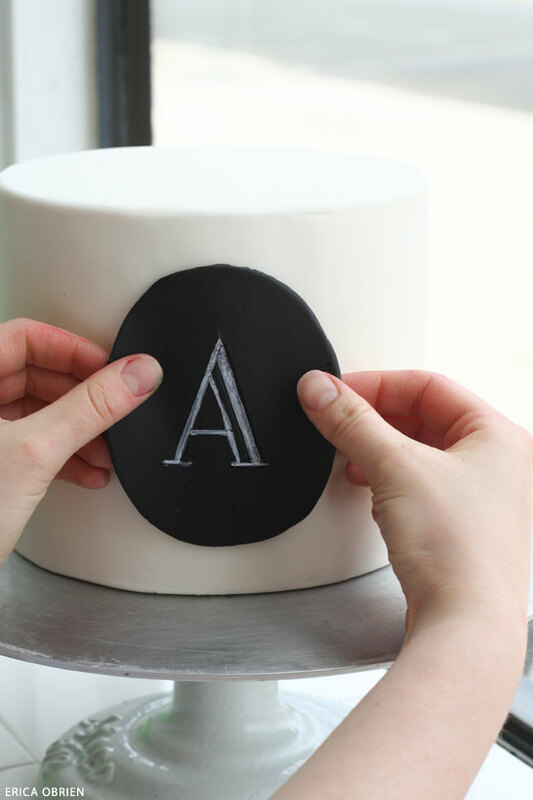 For the chalkboard, we rolled black fondant thin and laid it on a flat surface. We then mixed white petal dust with vodka and painted it on to our fondant chalkboard. 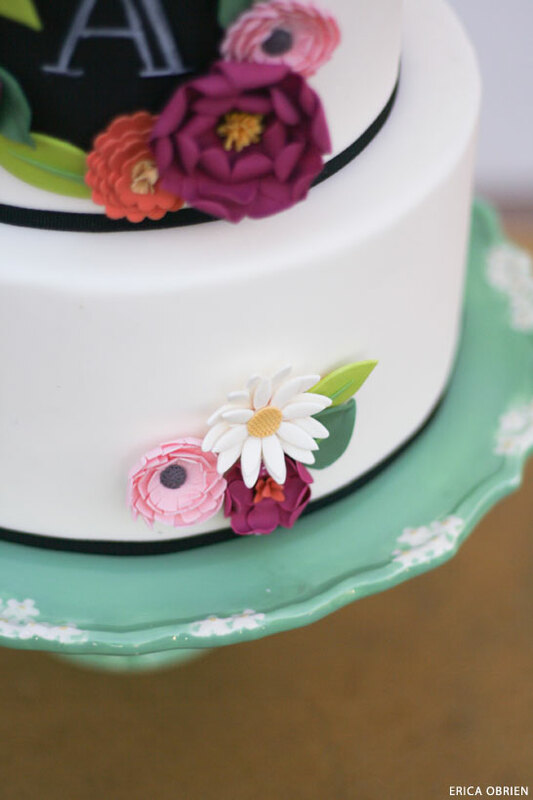 The cake is displayed on our 12″ Painted Flowers Cake Stand in Vintage Green, available in our online shop. Inspiration Image #1 : Rifle Paper Co. 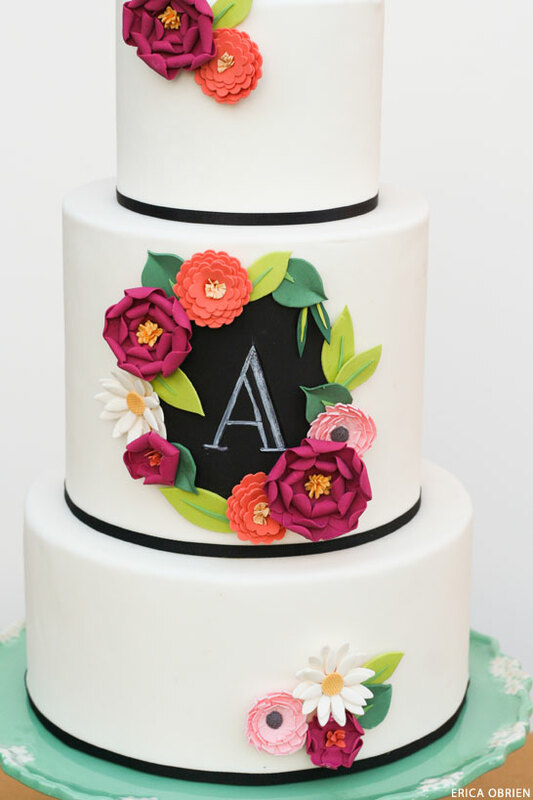 Loved this post as I do all the others..
Beautiful cake! I love the flowers. Love seeing the inspiration, design, and final outcome…beautiful! Excellent gift for teacher’s day on May 15th, in Mexico, thanks! Thanks Carrie, as always, for featuring our work! I love this design and the inspiration behind it. So rewarding to read your readers’ feedback! It is beautiful cake for wedding. I love this design and flowers. Beautiful cake I love the concept.